Patients with the pectus excavatum condition can have many different symptoms. 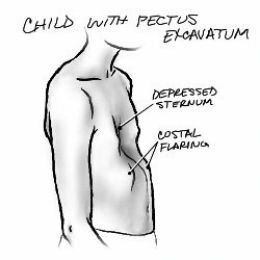 The pectus excavatum symptoms often vary in severity and their effect on the patient’s daily activities. The severity of the defect does not necessarily correlate with the severity of the pectus excavatum symptoms. Patients are asymptomatic at a younger age but start experiencing the pectus excavatum symptoms as they enter their teenage years. This is mostly caused by a worsening of the defect or an increase in physical activity and exercise. Despite multiple studies evaluating cardiac and pulmonary function, there has been no conclusive or consistent demonstration of physiologic impact correlating with pectus excavatum symptoms. Anatomic abnormalities, including decreased thoracic volume and cardiac compression, are thought to explain the physiologic effects noted by patients. The increased work of breathing from a partially restricted chest wall with impaired oxygen delivery to working muscles as the result of decreased venous return to the right heart may also play a role. Sternal compression is suspected to decrease thoracic volume, which can reduce the SVO, exercise tolerance, tidal volume, and vital capacity, causing dyspnea and a decrease in endurance with compensatory tachypnea during exercise. Cardiac compression can also reduce stroke volume and cardiac output in severe deformities, causing accelerated fatigue and compensatory tachycardia. A systolic cardiac murmur is sometimes heard and mitral valve prolapse is found in as many as 25% of patients. The percentage of pectus excavatum patients with mitral valve prolapse seems to increase with age. Dysrhythmias can also be seen, including first-degree heart block, right bundle branch block, and Wolff Parkinson-White syndrome. The psychosocial issues surrounding body image among teenagers can be significant, life-altering, and occasionally life-threatening. Poor body image and impaired psychosocial function is an enormously important concern for participating in a pectus excavatum exercises program. Pectus excavatum bodybuilding exercises along with proper bracing can significantly improve the difficulties with body image and limitations on physical activity that are experienced by patients. These results should prompt physicians to consider the physiologic and psychological implications of pectus excavatum just as they would any other physical deformity known to have such consequences. The majority of my patients with pectus excavatum symptoms reported significant improvement after participating in a specifically designed pectus excavatum program These findings, along with current ongoing investigations, further the argument that pectus excavatum exercises are indicated for symptomatic patients regardless of physiologic testing and is more than primarily cosmetic. You ought to write a guide on this. I’d be a buyer right away.